Two years ago U.S. Equestrian Federation “R” hunter judge Robert Crandall sat on the panel for the national and international hunter derbies held during The Ridge Farm’s Palm Beach Series in Wellington, Florida. But this year, Crandall traded his clipboard for tall boots and attended the show as a competitor, capturing the win in the $15,000 USHJA International Hunter Derby on March 16 riding Lysa Burke Hutton’s chestnut gelding On The Slye. 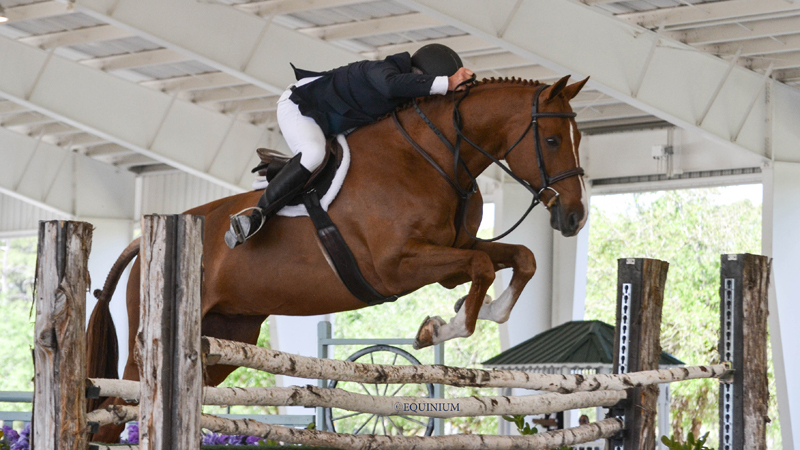 Lysa Burke Hutton’s On The Slye made his USHJA International Hunter Derby debut a winning one with Robert Crandall in the irons at The Ridge in Wellington, Fla. Photo by Holly Johnson/Equinium Sports Marketing, LLC. Crandall chose the high options with “Sardero” in the first round, which helped them place third, and then he focused on giving the gelding a quiet ride for the handy to produce a tidy trip and an overall winning score in the field of 21. Sardero started his performance career in France as a jumper, competing through the grand prix level. He entered the hunter arena for the first time when Crandall took over the ride about 1 ½ years ago. Crandall took his time with the 12-year-old Selle Français, teaching him the expectations of the hunter ring in the 3’6” green classes before trying him in the high performance divisions. Crandall was first made aware of Sardero through his friend Arly Golombek, but at the time the horse wasn’t for sale, and Crandall wasn’t looking. But then his client, Lysa Burke Hutton of Upperville, Virginia, asked him to go horse shopping. Crandall took a gamble by not trying the horse before recommending him to Hutton. “I very rarely don’t go to try them myself, but I trust Arly very much, and I liked the video so much,” he explained. The pair showed a little bit in 2016, but they really hit their stride last year, qualifying for the Washington International (District of Columbia), where Sardero placed second in the high performance hunter stake. Crandall credited Hutton’s patience and faith in his process with allowing Sardero to blossom. “She really gave me the time to let him develop,” he said. While Crandall has enjoyed a long career as a coach and trainer, these days he often presides ringside in the judge’s box, having recently officiated at Devon (Pennsylvania) and the USEF Pony Finals (Kentucky) among other prestigious shows. As for Sardero, the plan is to finish up the winter circuit in Florida before returning to Virginia. “We may or may not do the last derby of the series. It depends on how he feels that week,” said Crandall. “We will stay in the high performance, and our big goal is to gear him for the [Platinum Performance/USHJA International Hunter Derby Championship (Kentucky)].